Namaskar and welcome to the advanced certification modules that integrate Yoga (asana & pranayama) and Ayurveda (principles & therapies) and practical factors of vedic astrology. These mystical modules are both certification trainings for those expanding their role as a teacher/healer and also serve as a transformative gatherings to enhance personal spiritual development. Each module provides a deeper exploration into the yoga and ayurveda teachings for those who are currently enrolled in the 250 hour program offered at Dancing Shiva or any other certification completed through another school or institution. On the Ayurvedic side an understanding of the fundamental principles are necessary to apply to this program. The advanced program modules provides a comprehensive understanding of how both sciences are integrated into a dynamic and profound energy based model for healing. Each module strongly adheres to the practice of using the yoga-ayurveda unified system in a balanced relationship between therapeutics and spirituality. It essentially emphasizes an ayurvedic or therapeutic approach to the classical Raja Yoga model. As a “Yoga Therapy”, or integral approach to healing the mind, body and soul, each module weaves in the science of Tri-dosha (vata, pitta & kapha) and is applied to the various limbs of Patanjali’s Ashtanga Yoga Sutras. The course learning materials (manuals & books) and the teaching approach of the entire program is based in part on the lineages of Paramahansa Yogananda (Self Realization Fellowship) and Swami Sivananda Saraswati (Divine Life Society) and also the Vedic teachings of Pandit David Frawley (Vamadeva Shastri) of which has been adapted by Mas Vidal. The trainings also introduce the broader aspects of both yoga and ayurveda to allow the student to explore the deeper dimensions of their own spiritual quest. It strongly emphasizes a practical approach to learning and encourages deep study done independently as part of an expanding sadhana. Each 100 hour module includes captivating lectures, hands on practice, live stream sessions, recorded lectures, reading material and time for healing therapies. In total there are 3 ten-day modules offered yearly, each constituting 100 hours of certification-study. All modules are arranged in an open entry style so anyone can begin at anytime. Therefore the modules do not need to be taken in any particular order. Once the three modules are completed for a total of 300 hours, these can be combined with your 200 hour certification for 500 hour registration with Yoga Alliance. These 10 day comprehensive modules present an integrative healing model that bridges practical yoga asana and pranayama, hands on ayurvedic therapies. Each module also covers advanced teaching techniques and philosophy for teachers and the use of oils and herbs along with understanding the role of the astrological birth chart for insight into the dosha type and correcting physical imbalances. This dynamic immersion explores the practice of yoga postures as a therapeutic tool, combined with ancient ayurvedic acupressure therapy (marma) and breath techniques (pranayama), chakra healing therapies into a hybrid integral system of ayurvedic therapies. All components of this module provide a profound opportunity for healing and restoration through yoga along with the ayurvedic science of tri-dosha. Learn and practice yoga postures for inner healing and treating various diseases and disorders and how different medicinal oils can be used for healing. Learn how to manage pain and work through injuries. It is a transformational healing and educational experience. The Real Purpose of Asana: Understand how asana was used in the original manner to shift the mind into a more sattvic state of awareness. Creating Prescriptions: The art of creating presecritions for different dosha types and health related issues is an effect means for using asana, breathwork and other therapies. Integral Pranayama: Learn up to 12 different breathing techniques to manage the sun and moon energies. Asana For the Body Structure: Applying postures for scoliosis (spinal curvature), lumbago (lumbar spinal issues), kyphosis (hunch-back), injury, trauma, recovering for surgery and ayurvedic body type limitations. Learning the Art of Ayurvedic Oil Massage: A hands on review and practicum of the methods of this ancient healing treatment. Ayurvedic Treatments Combined with Asana for Healing: Warm herbal oil massage, use of herbs and steam and various pastes for treating muscular and skeletal issues. The Role Of the Breath in Yoga Therapy: How can the many forms of pranayama be applied according to Ayurvedic principles for addressing various disorders of the body. Deciphering the Astrological Birth (Natal) Chart: What are the clues in the chart that tell us about body, its shape, weight and function. What signs are given in vedic astrology to determine the dosha type (prakriti), identifying imbalances and remedial measures. Mantra, Sanskrit, Forms of Vedantic Meditation, Ayurveda & The Mind, Ayurvedic Therapies for Healing The Mind, Prana Therapy For Balanced Vayu, Agni & Soma Of The Mind, Developing the Power of Attention (Dharana), Healing The Mind with Bhakti (kirtan), rituals and prayer. All modules combine many yogic exercises along with ayurvedic principles and therapeutic secrets to heal the mind. We will practice various techniques for healing the mind-body relationship by cultivating the power of the body-mind and breath as well as the improving concentration through pranayama, sanskrit mantra (bijas, suktas and shakti mantras) and meditation as well as integrating various ayurvedic remedies relative to specific mental conditions. In a broader perspective the branches of Bhakti (devotion) and Jnana (knowledge) yoga are studied as spiritual and psychological indicators and the main paths for healing the mind. Along with the psychology of space, environment and the principles of intake (ahara) and output (vihara) to create an enduring therapeutic affect. The aim is to understand the nature of disease through the law of karma to erradicate lifestyle disorders and habits through purification of the mind and body in order to produce true healing and not the band aid approach of focusing on symptoms. Students will learn how to create integral prescriptions using postural yoga (asana), breathing techniques (pranayama), relaxation exercises (pratyahara), emotional balance, concentration and meditation to induce healing and promote living in a life of balance. Each module includes lectures, hands on application, reading material and some tele-conferencing sessions after the program is completed. This intensive training integrates a complete and balanced Vedic lifestyle experience. Including emphasis on daily routines and seasonal guidelines as well as deep daily yoga practice. The core of the day is comprised of approximately 7-8 hours of classes, lectures and hands on exercises. There are three meal times each day approximately 9am, 1pm and 7pm. Camping is an option and highly recommended for those wanting to connect with nature. The main facility is a cabin-style mountain house in the beautiful area of Pine-Strawberry outside of Phoenix, Arizona. All accommodations in the house are shared. Pre-requisites: 200 Hour Yoga Certification or Certified Ayurvedic Counselors or Practitioners . There are two days of virtual classes and one day for a special program project. These three days combine with the 7 days of live classes for a total of ten days or 100 hours of study. This is the ideal program for those interested in applying ayurvedic principles into a yoga asana teaching and therapy model. Good for those wanting deeper study into energy based teaching of yoga and ayurveda, which focuses on the principles of the five great elements and the science of Tri-Dosha. A integrative study of yoga and ayurveda for health and wellness practitioners that want to expand their healing capacity. Our Dancing Shiva programs are approved by the National Ayurvedic Medical Association (Nama). This gives ayurvedic practitioners credit for their continuing education requirements. This program is also good for those wanting to complete their 300 or 500 hour registration with Yoga Alliance. STEP ONE: Fill out the application. Download Program Catalog *Please download a copy of the catalog for your records. Each module is $1750. You can pay for a single module, or pay for a single module plus the one time registration fee. Specific sections of the below texts are referred and studied during each program module therefore it is important for you to have these texts and begun some reading prior to attending the modules. These readings are equally important to the program manual. Note: A program manual is provided for each of the three modules. The above listed books are linked to purchase from Amazon however you can also order them through www.Natarajbooks.com and use the coupon code “DSYA”. Wait patiently for the program to start and in the mean time do some reading and share your excitement with others with a big bright smile. I completed the 300 hour advanced Yoga and Ayurveda program with Mas Vidal. The certification program was phenomenal! The program took my understanding, experience, and teaching of Yoga and Ayurveda to a deeper and practical place immediately. In regards to my personal practice, my meditation practice and dinacharya (daily routine) were solidified following the teaching lectures and practicums. Mas provides a wonderful space to ask questions and for self-inquiry. He blends in his passion and sense of humor within the teachings making the lectures even more enjoyable. 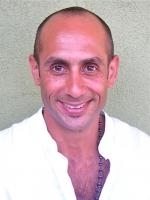 Mas shares his passion and wisdom of Ayurveda and yoga from his heart and truly is a Teacher and Light. He continues to remain supportive and accessible as I deepen my understanding of Ayurveda and yoga beyond the completion of the program. The program will take your personal practice and teaching to the next level. You will leave with a greater, multidimensional perspective of your students and gain increased confidence as you share the teachings seeing your students from the lens of both Ayurveda and Yoga.